Napoleon’s Triumph, by Simmons Games, is one of the most innovative war games in several years. Unfortunately, this unusual system has, to some, been an obstacle to learning the game and fully enjoying its novelty. I hope to smooth the learning curve for new players of this marvelous game by explaining the attack sequence in the way that real world commanders would see it. Hopefully, from this point of view, the elegance and subtlety of the combat resolution will no longer confound the players so they may fully appreciate the sophistication of the design. This article does require some familiarity with the game but I will quickly summarize the major features so that all can follow along. The units are represented by rectangular blocks printed with a number of infantry, cavalry or artillery symbols that designate its unit type and strength. Fog of war is paramount since the unit strengths face away from your opponent. Typically units are aggregated into Corps commanded by various historical leaders however Independent Units are not attached to a Corps requiring them to be individually commanded. Each side has a certain number of Corps Orders and Independent Orders that can be issued to units. The battlefield of Austerlitz is divided into geographic areas named Locales. The borders between Locales are called Approaches. Within a given Locale, units can be in one of two Positions, either occupying the central portion of the locale termed the Reserve or deployed along the border in the Approach. Units in the Reserve position may move to the Reserve position of any adjacent locale or move into the approach of the locale it currently occupies. Units already in the Approach may move into the Reserve of its locale or cross the Approach into the Reserve area of the Locale directly adjacent. 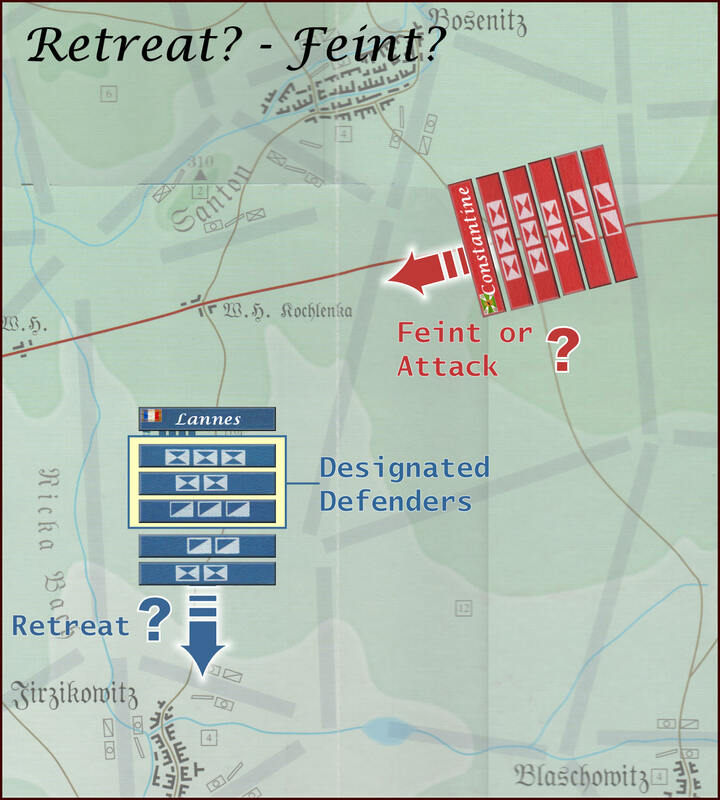 When units attempt to move into a Locale occupied by enemy units, there is combat and the attack sequence is resolved. It is the combat sequence that seems to be the source of the greatest confusion when attempting to learn the game. I will now attempt to give you a general sense of how a typical combat flows without getting into the intricacies of each step since they are clearly explained in the rules. In this manner I hope to impart the overall concept of what each combat step represents on the actual battlefield thereby illuminating the elegant logic of the Attack Sequence. Let’s look at each step a little more closely from the point of view of the commanders on the field and how the tactical decisions they make are reflected through the attack sequence. You are now Marshal Lannes, Napoleon’s trusted Corps commander in the French Army with instructions to hold the Locale at the town of Rochlenka. There are five possible Approaches bordering this Locale. As the commander charged with its defense, you must analyze the terrain and the most likely avenue through which the enemy will attack. The Allied commander, General Constantine, has marched his Corps into an adjacent Locale. You see enemy troops moving down the road East of your position. You do not know their intentions but, as any good Corps commander, you must prepare for the worst. There is a threat to the East, a threat of attack. The Attack Threat is where the attacker announces his intent to attack a given Locale through a given Approach. He must have units that could potentially move through the Approach designated in the Attack Threat. An important concept here is that he does not yet designate which units will make the attack. He simply points to a given approach and states that an Attack Threat will be coming through this Approach. He’s forcing the defender to make a decision about defending the Locale or retreating. Lannes is now forced to make a difficult decision. He has five divisions under his command and has five possible approaches he may need to defend. If he commits all of his divisions to the defense of this one threatened approach, he will leave other approaches open for enemy troops to outflank his troops. As Napoleon ordered him to defend this Locale at all costs, he decides not to retreat. He decides to commit 2 infantry divisions and one heavy cavalry division to defend against this particular attack threat. The defender now must decide whether he’s going to retreat out of the Locale or defend. If he decides to defend, he must name which units in the Locale he plans to allocate to the defense of the designated Approach. Constantine views enemy troops along his planned Line of March. 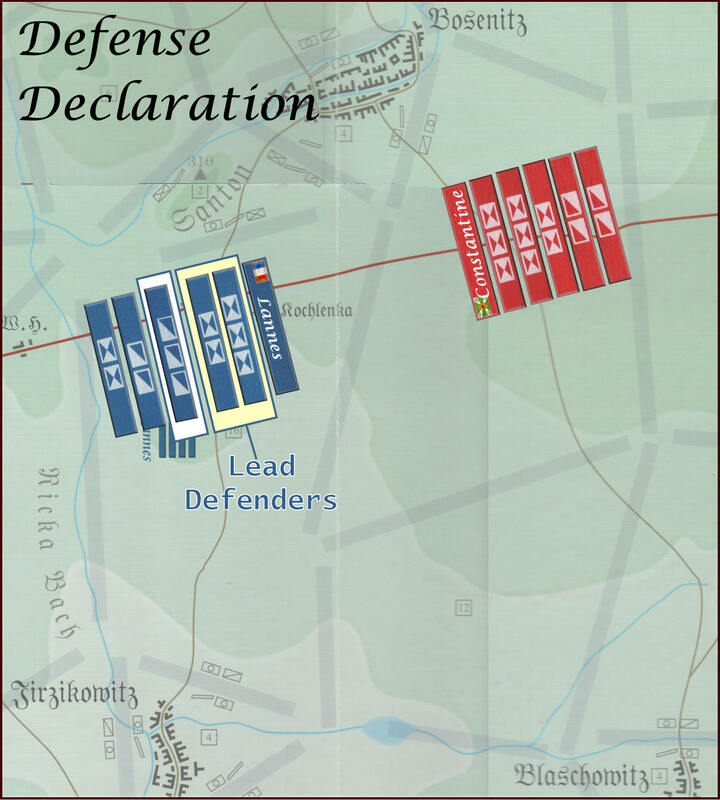 His orders are to attack and try to break the French center. Therefore he decides to push his attack up the main road directly into the Locale that Lannes is defending. There will be no feinting here! He has not yet decided who will attack or how many troops he will commit, but he knows that he must push the French before him. As his troops continue to march, he will wait to see how the enemy deploys before deciding on his plan of attack. The attacker may now declare his Attack Threat as a Feint which means he is not really going to attack through that approach and the attack sequence will end here. Feints are useful to draw away defending enemy troops so that fewer are available to defend other approaches in an enemy occupied locale. As this Attack Threat is not a Feint, the Attack Sequence proceeds. Lannes looks to the East and sees enemy troops moving towards his men along the main road. He now must prepare his defense plan. He decides to have the two infantry divisions up front as the leading units. These units will take the brunt of the attack and will try to hold at all costs. He will hold his cavalry just behind the lead infantry in the event his infantry divisions are not strong enough to repel the initial assault. If his infantry falters, he can order the heavy cavalry to counterattack. The defending player now names his leading units. These must be named from the units he designated to defend the Approach. You can think of the leading units as the units in front of the line who are going to take the brunt of the initial attack. If the approach is wide he can designate up to two units to be the leading units in the defense. If it is a narrow approach the maximum number of leading units is one. There are certain restrictions as to which units can be named leading units and these are clearly explained in the rules. Constantine observes through his looking glass the French troops deploying. He now realizes that the French plan to contest his advance. He has three infantry divisions and two Cavalry divisions in his Corps. He gathers his division commanders to discuss his plan of attack. Constantine decides that he will attack with his entire Corps and selects his two strongest infantry divisions to lead the attack. He speaks to their commanders and now Orders the attack. This is similar to the Defense Declaration. At this time the attacking player must decide which pieces will be committed to the attack and designate leading units (up to 2 units for a wide approach or one unit for a narrow approach). 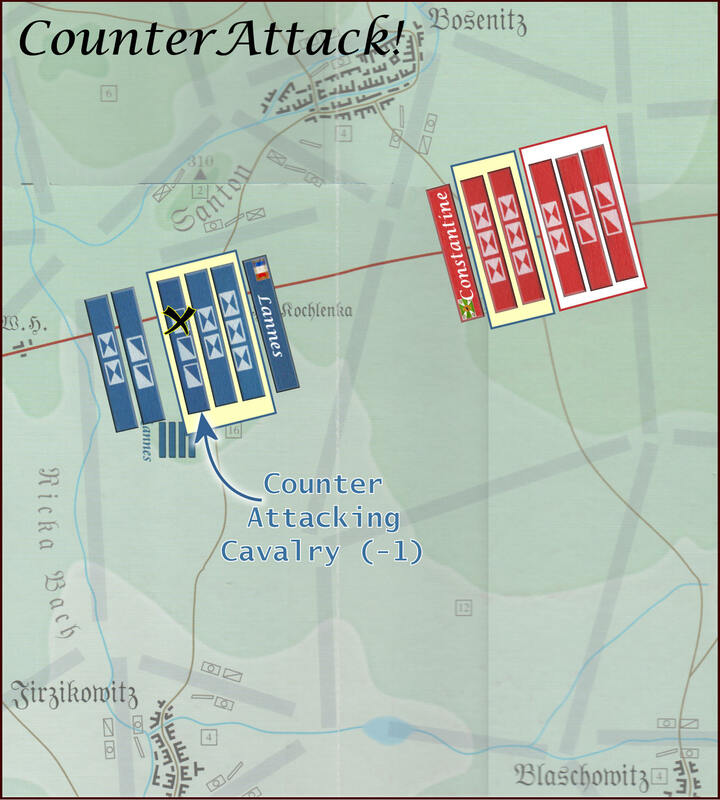 Even though only 2 units can lead the attack, designating more attacking units than the defender gives advantages if there is a tied combat result. Once again there are restrictions as to which units can be designated to lead the attack. A Corps order is then expended to move the units to initiate the attack. 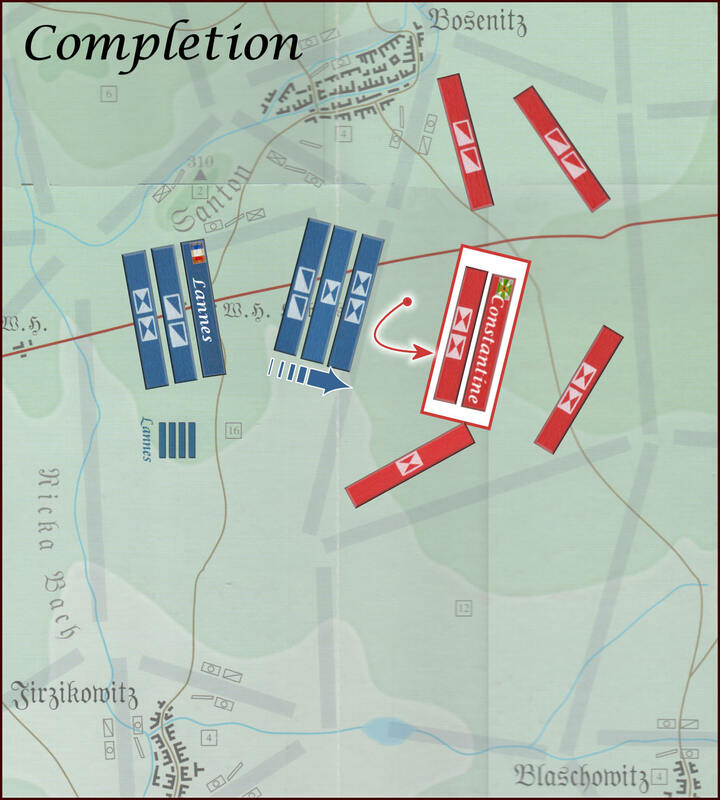 The Allied line now advances and the leading units start to exchange fire with the French. The troops are choked by the gray smoke as their musket’s discharge. After several volleys of fire, the Allied troops charge forward and the wild melee ensues. 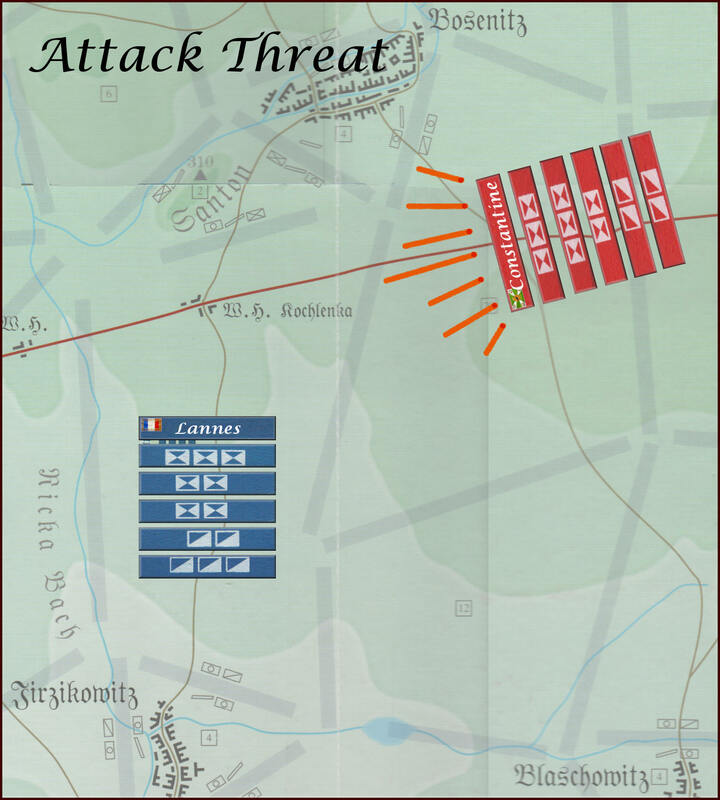 At first the French troops stand their ground but unrelenting pressure forces them to waver. Lannes sees his leading line units faltering. This is actually very simple. Both sides sum the strengths of their respective leading units with appropriate combat strength penalties applied. Whoever has the greater total combat strength is the winner of the Initial Result. In this case, Constantine has 2 units each with a combat strength of 3 making his total combat strength 6. Lannes has an infantry unit with a Combat strength of 3 and one with a strength of 2 for a total of 5. Since Constantine has 1 more than Lannes, he is the winner of the Initial Result. Lannes is determined to hold this Approach or the entire French army could be jeopardized. He has never let Napoleon down! Of the three units he has committed to defend this approach, he still has the heavy cavalry division available to counterattack. He launches them into the unsuspecting Allied troops at a critical moment! The defender has the option of adding more units to the fray in the hopes of reversing the momentum of the initial attack. 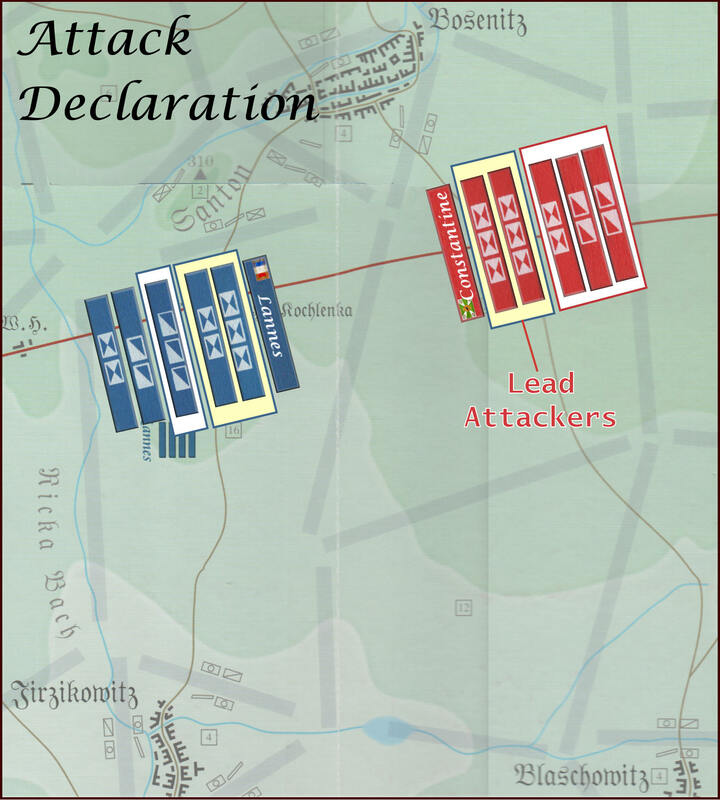 The units designated to counterattack must have been selected as defending units in Step 2 (Retreat Option). Units that counterattack automatically lose one step but will have their remaining combat strength added to the defending leading units in the next step of the sequence where the final result is determined. Once again there are certain restrictions as to which units can be designated to counterattack. Initially the French line was being forced back but the brave charge of the French cavalry takes the Allied infantry by surprise. They are outnumbered and outmaneuvered. Suddenly their attack collapses and the proud divisions of the allied army now feel the momentum has turned. Their attack has been repulsed. In this step the battle is actually decided. It is computed exactly the same way as in the Initial Results step, except that the combat strengths of the defender’s counterattacking units are now included. Whoever has the greatest total combat strength wins the combat. The addition of the counterattacking cavalry has changed the math. Constantine still has 6 from his 2 infantry divisions but Lannes now has 7 (5 from the 2 infantry divisions and 2 from the cavalry since it immediately lost 1 strength point when the counterattack was declared). This results in a French victory! The Allied troops reel at their losses and leave dead and dying men on the ground. Some of the more courageous struggle to help the wounded as they contemplate retreat back up the road whence they came. Losses are inflicted on the attacking units. In general, the loser takes losses equivalent to the number of the opposing player’s lead units and the difference from the Final Result. In this case it is the attacker who will take the additional losses. So Constantine will take 2 for the two French lead defending units plus an additional 1 from the net differences in strengths in the Final Result Step. The medical corpsman start to treat the French wounded strewn all over the blood soaked ground. The defenders have suffered mightily but have repulsed the Allied attack. It is now time to consolidate their position. The winner takes losses equivalent to the number of opposing lead units. 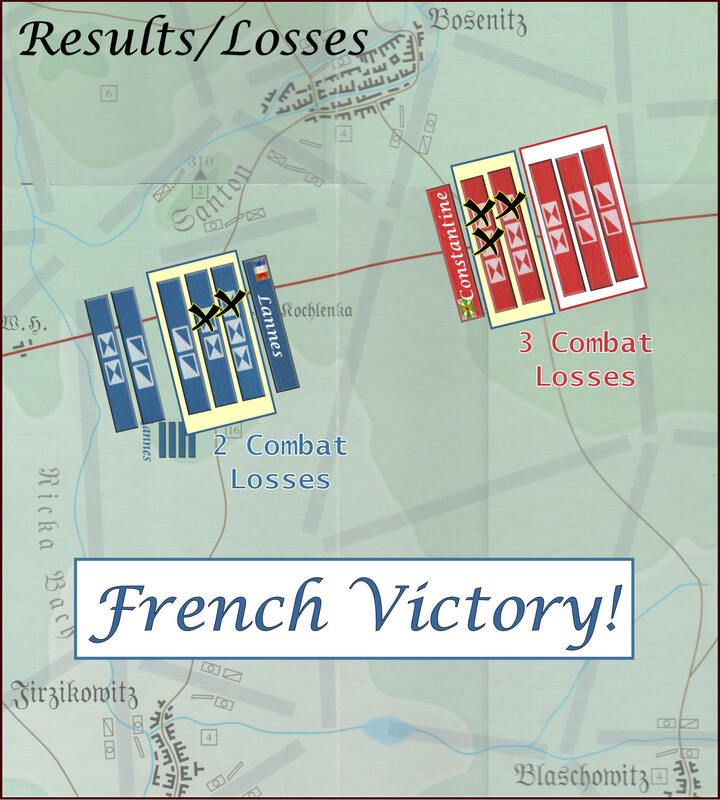 Since the Allies had 2 leading units, Lannes must take 2 losses. The Allied troops retreat up the road back to the Locale from which they came. Constantine now has to contemplate his next move. His Corps has been bloodily repulsed and is now shattered. His attempt to pierce the French center has utterly failed and he will need time to reorganize his corps for another try later in the day. Meanwhile, Lannes decides to deploy some troops into the approach to better defend the road. He hopes that there will be no new attacks along this approach so that he can focus his remaining divisions on defending the other approaches to this Locale. For now, he allows himself a brief smile. He has served his Emperor well this day but there is more fighting… and more dying to be done. In this step the loser must retreat his combat units. Corps that lose in battle must detach all but one unit leaving the Corps hopelessly shattered. Each turn they will have a chance to reattach one unit but it is a lengthy process to reorganize the Corps. The winner, in this case the defender, can now use any defending units that survived the combat to advance into the Approach. This tends to give them a defensive advantage in subsequent combats. I hope this vignette increases your understanding of the logic of the attack sequence and allows you to visualize what is happening on the battlefield at each step. The attack sequence is the heart of this game and must be mastered before players can fully appreciate the nuanced beauty of Simmons’ design. I have deliberately omitted the specific mechanics and restrictions involved in each attack step so that you get a sense of the forest without being blinded by the trees. I suggest you now go back to rules and use this narrative to visualize each individual attack sequence step and its associated procedures. In my opinion, Napoleon’s Triumph is aptly named. It is truly a triumph of design. Simmons has delivered a most innovative war game that evokes the feel of Napoleonic grand tactics. The rectangular units and board graphics conjure the visual beauty of the period maps we have so often scrutinized. I strongly urge anyone interested in the Napoleonic era to take a look at this game and not be deterred by its pioneering concepts. Once digested, you’ll be aptly rewarded with hours of tense, challenging play. Posted in Napoleon's Triumph. Bookmark the permalink. Cannot understand why there is no battles with this system for Fredrick the Great, the Seven years wars battles with like a double sided or quad maps for 2 or 4 battles and common components. Absolutely! It seems like any 18th century battle would be appropriate for this system.